An Indian Geostationary Satellite Launch Vehicle (GSLV) lifting off. 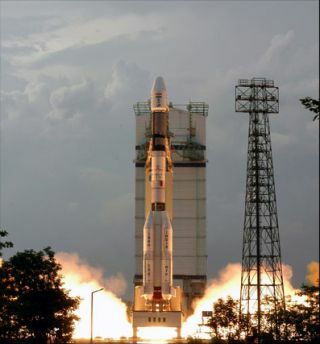 BANGALORE, India - A turbo pump malfunctionis being blamed for the April 15 launch failure of India?s GeosynchronousSatellite Launch Vehicle (GSLV). The rocket veeredfrom its flight path nearly five minutes after liftoff and crashed into theBay of Bengal along with a communications satellite. The Indian Space Research Organisation (ISRO)said Friday that investigators tracedthe failure to a turbo pump malfunction that abruptly stopped the flow ofliquid hydrogen fuel to the thrust chamber of the rocket?s domestically builtthird stage just 2.2 seconds after its ignition. ISRO officials said in a statement thatinvestigators do not know for sure why the turbo pump failed but suspect thatexcessive pressure built up and thermal stresses produced ?gripping at one ofthe seal locations? that caused a rotor to seize and rupture the turbinecasing. A series of ground tests are planned to confirm the scenario, theyadded. The launchfailure is a setback for India?s plans to attain self-sufficiency incryogenic propulsion development. ISRO spent 3.3 billion rupees ($70.5 million)to develop the engine. ISRO aims to flight test the upper-stageengine within a year ?after incorporating necessary corrective measures,? thestatement said. The next two GSLVs, meanwhile, will use Russian cryogenicstages.